UIWebViews have a built in gradient at the top and bottom. If you set the UIWebView’s background color to clearColor, this gradient is still visible. How can we turn off this gradient to make the UIWebView completely transparent? 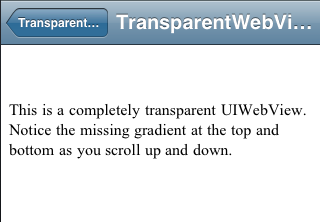 The UIWebView API doesn’t expose this gradient, but we can be sneaky and look at it’s view hierarchy. So a UIScrollView contains a UIBrowserView filling up the UIWebView which we can assume is the actual web view and then a bunch of UIImageViews at the top and bottom are used to show the gradients. So how do we hide them? This hierarchy may well change in future iOS versions, so the less assumptions we make the better. We shouldn’t assume that there is a UIScrollView with embedded UIImageViews, but we do have to make at least one assumption: That the only UIImageViews are the ones used for the gradients. So how do we find all the UIImageViews and hide them? 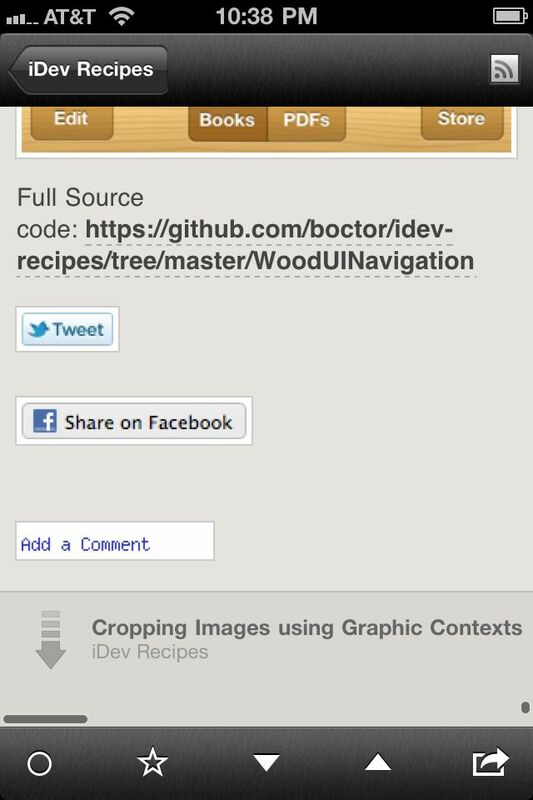 A view can contain any number of subviews, so we need to walk the view hierarchy and hide any UIImageViews we find. 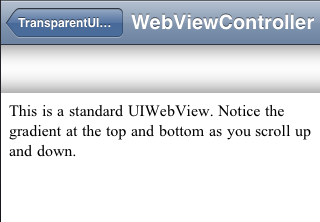 To be safe, we should do this before we load the UIWebView with any content.